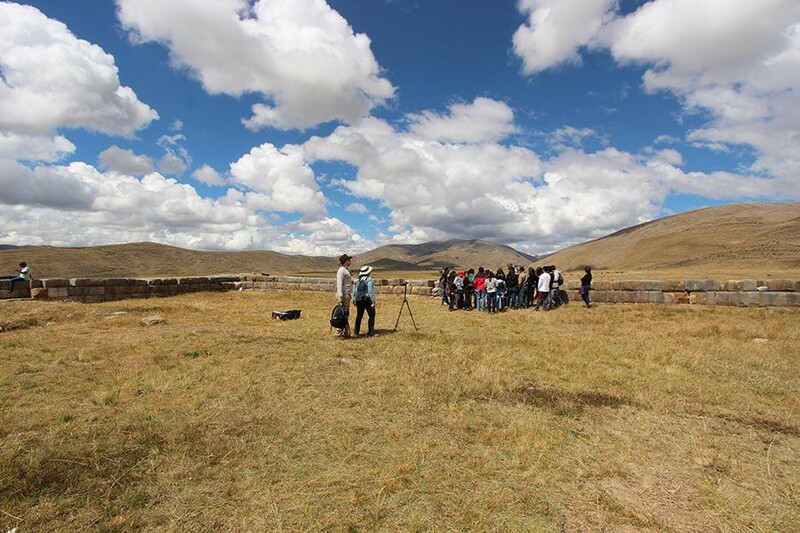 The 2015 acoustical field survey on and around the central plaza platform (“ushnu”) at the Inca administrative complex of Huánuco Pampa advances understanding of Inca communication dynamics and innovates archaeoacoustical methodologies. We detail here a new archaeoacoustics method that cross-compares a sequence of human-performed sound sources along with a standard electronic acoustical test signal across survey points. This efficient and rigorous archaeological experiment produced extensible data and observations regarding Inca-designed site sonics and multi-directional communication dynamics. Our experiment design combines ecologically valid acoustical measurements with subjective researcher-observer data to chart sound transmission and reception of different classes of sound-producers, enabling the identification of environmental contingencies, and the estimation of site acoustical features. Calibrated, multiply repeated sonic test signals were measured from a strategically chosen set of geo-located and photo-documented source and receiver locations in absolute, relative, and subjective terms, simultaneously for each source-receiver pair. This method offers a systematic and comprehensive understanding of site-specific sonic dynamics via in-field observations and data recording, frequency-range comparison across test signals, attention to acoustical metrics and psychoacoustical precedents, and emphasis on practical repeatability for a range of archaeologically relevant sound sources. Our study posits the central platform at Huánuco Pampa as a strategic point for Inca elites to both observe and influence activities across the site, a finding extensible to other such platforms. The prominent architectural platform would serve as a tool for multi-directional communication, as well as to facilitate messaging about elite presence and imperial identity through the projection of sonic-visual displays. 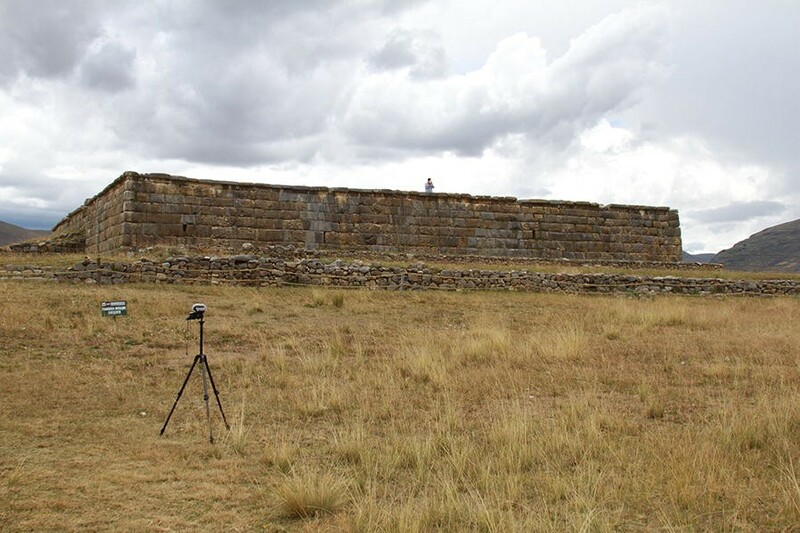 Beyond producing data about Huánuco Pampa and Inca architecture, our case-study implementation of this new method demonstrates an efficient and systematic approach to tracing the acoustical contingencies of architectural materials in archaeological contexts. This article details our case-study application of a new, efficient, and comparative method for archaeological acoustical surveying, a methodological contribution to archaeoacoustics and archaeological fieldwork practice. 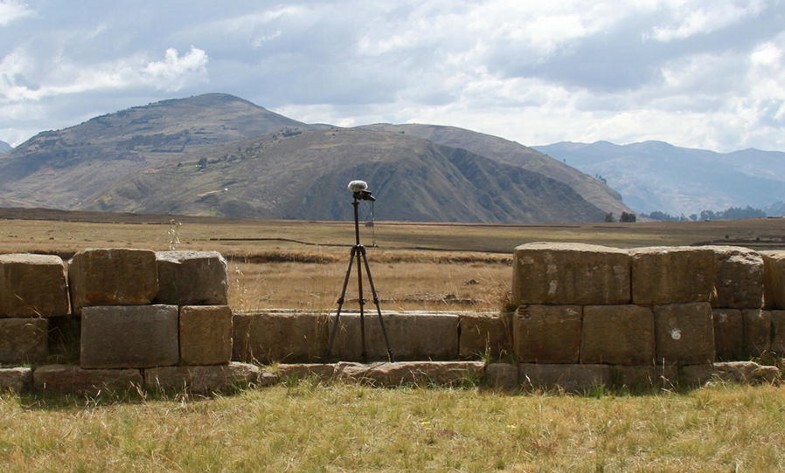 Sonic communication was important to the Inca Empire, and thus this site-specific adaptation of theory and methods from acoustical science produces materially contingent evidence for past human interactions. The benefits of the new method described in this paper include attention to ecological validity and rigor through multiple forms of evaluation (measured, recorded, researcher-observed) using a sequence of archaeologically appropriate sound sources whose differing acoustics enable a comparative analysis across sources with respect to each survey location. In-situ testing of sonic communication dynamics can reveal features of site architecture and its landform settings, as well as produce data for reconstructive modeling. Experimental acoustical fieldwork enables ground-truthing of estimations from modeling techniques and anecdotal reporting. The case-study site for the application detailed in this article is Huánuco Pampa, an Inca administrative center in the central Peruvian highlands, where we have focused on acoustical communication dynamics afforded by its central plaza architecture. To evaluate historical descriptions of the sonic properties of Inca central plaza platforms (as discussed in this “Introduction” section), we draw on established acoustical science principles, measurement, and analysis techniques. From a disciplinary perspective, archaeological interpretation typically deals with lengthy time scales, whereas in contrast, archaeoacoustics research targets the shortest increments of time that humans perceive, sonic events. Our study examines physical dynamics of site spaces to reveal features of immediate experiential valence. By tracing how humans may have related to one another via spatial dynamics, we can better understand patterns of spatial use over longer timescales. Physics-based archaeoacoustics allows an empirical examination of how architecture and environment facilitate sound transmission and reception. Site sonics are studied here as both temporally and spatially scalable, relevant to the understanding of site architecture in its landform setting, and therefore the landscape archaeology. Finnegan  defines communication as “the interconnecting of humans,” following from which Kolar  poses that sound enables such interconnections, and by extension, that sound-modifying structures and objects can be a source of archaeological evidence. In our study, acoustical science and auditory psychology guide our evaluation of sonic communication dynamics, as a function of place (acoustics), and with respect to human sensing (psychoacoustics). This approach has rarely been applied to archaeological sites, where it can offer valuable perspectives on aural and embodied communication. The Inca Empire (c. 1400–1530s CE) was the most powerful indigenous New World state, and one with distinct characteristics from archaic Old World states. The absence of writing in the pre-Columbian Andes imposed significant communication challenges for an empire that ruled millions of people speaking different languages. Inca officials used the khipu, a knotted cord device, to encode some classes of information, and they stationed runners along their main roads to transmit messages quickly. Despite these aids, a ready means of disseminating state-directed communications was lacking. The constraints on Inca mass communication raise questions about how a society might use sonic messaging for state administration. Inca-style buildings facilitated face-to-face communications, but the largest structures (called kallankas) accommodated no more than a few thousand people . Inca-style architecture is not sufficiently well-distributed to meet all imperial communication needs, and large structures appear to be restricted to royal estates, administrative centers, and religious complexes . These spaces facilitated encounters between Inca nobles and selected audiences, but they were less useful for broader or lower-order state communications. Many kallankas open onto plazas that could hold large crowds, and Colonial writers describe the role of processions and plaza performances in Inca political and ritual life [5, 6]. The Haucaypata plaza at the Inca capital, Cuzco, was used for municipal and imperial ceremonies that gathered thousands of participants, while smaller plazas in nearby palace compounds served complementary functions . In highland provinces, the Incas laid out huge central plazas at several regional capitals, the best preserved of which approach 20 ha [8, 9]. Spanish eyewitnesses to a festival at Hatun Xauxa described a crowd of 120,000 that came “in squadrons” from surrounding villages, gathering daily in the central plaza to be counted and inspected by Inca officials . Inca officials choreographed processions whereby subject populations entered central plazas, designating spaces for different administrative and ethnic groups. Having assembled a living provincial mappa mundi in the plaza, Inca governors moved among the assembly, checking khipu records, assigning tributary responsibilities, and performing mass marriages to create tributary households . After state administrative reviews and ritual performances, provincial subjects dispersed from the Inca center, returning to local villages or setting forth on new service assignments. Colonial descriptions of Inca central plaza events emphasize the physical separation of the ruler and important supernatural objects (wak’a) from subject populations. Platform spaces in the plaza allowed these powerful entities to be seen reviewing and bringing order to the proceedings. One detailed account of ceremonies in the Haucaypata  transcribes prayers recited by the Inca ruler, suggesting that speech from the platform was intelligible to the assembled crowd. Other authors mention the existence of similar constructions in the central plazas of provincial centers, one of them  noting that “in each of these towns [the Incas had] a great royal plaza, and in the middle of it a high square embankment with a very high staircase; and the Inca and three of his lords would ascend it to talk to the populace and to see the people of war when they had their assemblies and reviews” (author’s translation). Colonial chroniclers present a model for Inca visual and verbal information exchange using central plaza platforms. This emphasizes bidirectional visual signaling—Inca subjects glimpsing the emperor and key totems, while performing under the sovereign gaze—accompanied by detailed verbal communication from the platform to the broader plaza space. If practicable, such an arrangement would enable the inner elite of the empire to disseminate its values and orders directly to a large proportion of the population, without concerns about miscommunication or replication errors. Whether such a scenario is acoustically realistic is a significant question for the study of non-literate communication, but no comprehensive archaeoacoustical research had been conducted prior to our study. Recent scholarship addresses the ritual functions of Inca platforms, often referring to them as ushnu, a Quechua term defined as a ceremonial rock or feature for receiving liquid offerings, as well as a stone platform, usually at the center of a plaza space [13–15]. This imprecision has produced studies of “ushnus” that comprise a wide range of natural features and structures that vary in size, construction materials, and socioecological contexts . To date, the only prior acoustical survey on Inca platforms is a soundscape-framed study conducted by Meddens and Frouin  on remote high-elevation ritual platforms in the Ayacucho region; Stobart  extends their findings to musicological research in the context of such platforms. Our study focuses solely on the acoustical properties of central plaza platforms at administrative sites, a class of structures that varies architecturally and appears in plazas of different sizes . Our 2015 fieldwork at Huánuco Pampa (Fig. 1) studied the largest such platform, but additional work is needed to understand smaller platforms with different construction features. Inca imperial power ran through highland administrative centers built between modern Quito and La Paz, which were connected by an elaborate road network [13, 19]. Most provincial centers lie beneath modern settlements, making them archaeologically inaccessible. Huánuco Pampa is the largest, best preserved, and most intensively studied of those that survive . 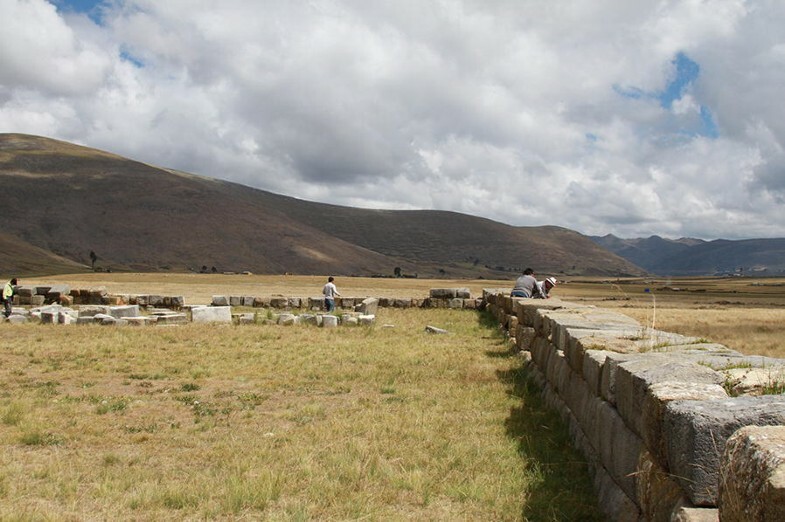 Located in the northern Peruvian highlands, Huánuco Pampa was constructed in the late 1400s and partially remodeled before the European invasion. A failed Spanish Colonial settlement altered parts of the central plaza, but centuries of virtual abandonment left vestiges of roughly 3700 Inca-era structures for archaeological study. Initial archaeological investigations and consolidation began at Huánuco Pampa in the 1960s, and Morris extended the preliminary work through mapping (Fig. 2) and widespread excavations . More recently, archaeologists from Peru’s Ministerio de Cultura have carried out new investigations, and in 2014 the site was added to UNESCO’s World Heritage List as one of 273 properties exemplifying the Inca road system, Qhapaq Ñan. Today, the stone-faced central platform and nearby administrative palace are key features. Inca urban planning at Huánuco Pampa began by designating a large, flat space for the central plaza and bounding it with a series of great halls. Radial accessways between the buildings granted access to outer parts of the site and connected with the main imperial highway. At the center of the 19 ha plaza, the Incas built a large rectangular platform (32.5 × 48 m), faced with blocks of finely cut stone—the aesthetic signature of the imperial heartland . Rising 4.5 m above the gently sloping plaza level, the platform served as a special gathering space within the vast plaza. The platform top was built 1.5 m below the top of an enclosing wall that obscures most platform activities from viewers standing nearby. Along with two entryways at the top of the single staircase from the plaza, the enclosing wall of the platform top is inset with ten wide “niches” that could serve as inward-facing seats, or as low platforms for surveying the Inca city in all directions (Fig. 3). Previous researchers note the astronomical alignment of some niches , but these also could function as stations to monitor plaza activities other parts of the site. Our acoustical work demonstrates that these niches were important for the visual and sonic projection of humans. The distribution of Inca-style masonry and artifacts reinforces accounts of the visual exchanges between central platforms and people gathered in surrounding plazas, but the scale of the Huánuco Pampa plaza raises questions about sonic communication; for example, the dynamics of sound-producing activities by large groups gathered in the plaza, and the range of effective verbal and instrument-facilitated communication between platform and plaza, among other interactive scenarios. To address such questions, our survey tested and documented the physical dynamics of sound transmission and reception on and around the central platform at Huánuco Pampa. Our 2015 field research differs in important ways from earlier archaeoacoustics work. Andean approaches have developed since Moore [21, 22] associated site and architectural features with ranges of intelligible verbal communication. In their field research at Caylán, Helmer and Chicoine  focused on speech performance qualities, equating “volume” ranges with “ways of speaking” related to social function. Scullin  pioneered an extensive outdoor acoustical survey at the Huacas de Moche, using electronic instrumentation for both sound production and detection/reception. Adapting archaeological survey methods, her crew used handheld GPS devices and sound level meters to make readings every 10–20 m in straight lines radiating from the sound source, an omnidirectional loudspeaker reproducing pink noise. Scullin divided her results into “high” and “low” frequencies, using them to estimate transmission-reception dynamics of portable Moche sound-producing instruments, such as whistles. For the Inca Empire, the study of high-altitude platform sonics by Meddens and Frouin  treats sound as a spatial constraint. Using Colonial documents to estimate the constituents of a musical-performance-based Inca “landscape of sound,” their multi-site study focused on unidirectional sound transmission from platforms outward, via experimental tests made with human voice, drum, and pututu. Beyond the Andes, archaeoacoustical studies frequently document sound effects, and more rarely, explore the inter-dynamics of sonic features and their perception [25–28]. Mills  documents present-day soundscapes around archaeological sites, and considers these “contemporary sonic fabrics” in relation to period-specific soundscape components. 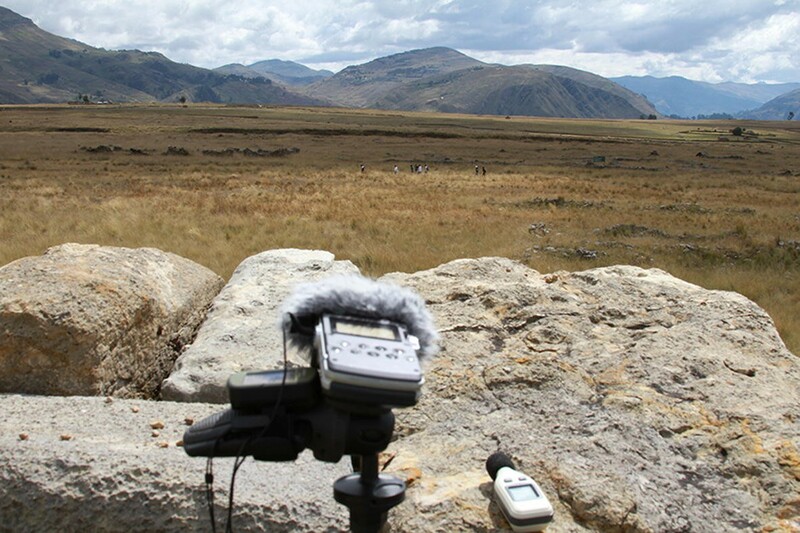 At Huánuco Pampa we followed Kolar’s [27, 30–33] ongoing integrative archaeoacoustics work at the Andean Formative center at Chavín de Huántar, Peru. 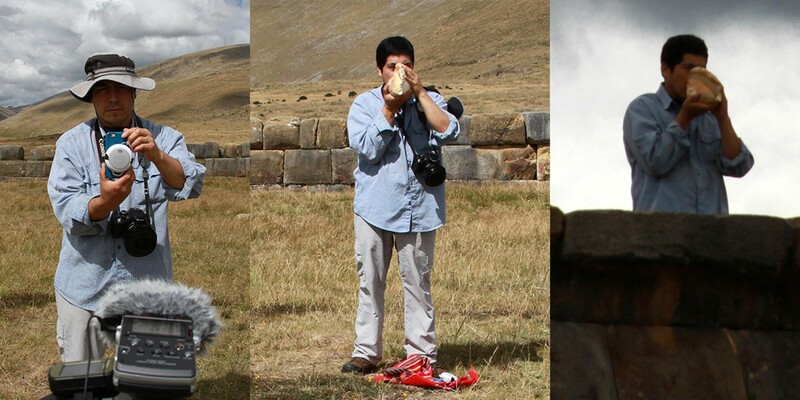 During initial research at Chavín in 2008, Kolar and colleagues demonstrated the importance of observational testing using a variety of soundmaking instruments and devices. In subsequent research 2009–2012, Kolar developed a comparative approach to testing site sonics and subjective responses, which guided our 2015 work at Huánuco Pampa. This new study detailed here innovates in three regards. To maximize efficiency, we used site archaeology and documentary sources to evaluate and specify the study area for sampling representative points. We documented and analyzed sonic test signals at calibration and survey points with absolute and relative measures (annotated both quantitatively and qualitatively) to enhance the rigor of field data collection, including audio recordings for post-survey analyses. Finally, the study employs acoustical metrics that permit the extension of findings to other contexts. Three acoustical principles are essential for any physics-based archaeoacoustical experiment. First, sonic testing requires two components, a sound source and a receiver of the sound; the relationship of these so-called “source and receiver pairs” is the basis for spatial acoustical measurement. Second, as acoustical measures and human auditory perceptions do not directly correspond, sonic frequency data is needed to provide crucial information about how sound can be received and perceived. Third, the acoustical directivity pattern of the sound producer influences the initial path of sonic propagation. Geometrical relationships describe how sound spreads to interact with surfaces and objects, as a function of its frequency content. Therefore, to produce data towards estimating the human perceptual implications of spatial sonics, we begin by drawing from established acoustical references to pose a conceptual framework for tracking sound propagation. The outdoor setting of our survey provides significant theoretical challenges and therefore, a theory-referenced empirical study is an essential starting point for disentangling factors that together constitute acoustical features of the site, including atmospheric/air absorption, buildings/barriers, surface and ground effects, and meteorological conditions, as given in overviews of outdoor acoustics by Attenborough  and by Rossing and Fletcher [35, p. 277–93]. Since our case study combines an outdoor setting with architecture—including semi-enclosed constructions such as the platform-top—geometrical acoustics theory is useful in anticipating and visualizing architectural interactions, as discussed by Blauert and Xiang [36, p. 161–76] who provide a useful visualization of a sound source and receiver relationship [36, p. 163]. Typical considerations for field measurements of architectural acoustics are given by Long in a detailed volume on the topic [37, p. 124–32]. For introductory discussions of acoustical and psychoacoustical principles, we suggest Howard and Angus’ musically oriented textbook as a handy reference ; of particular relevance to this paper are the sections on sound propagation and interactions [38, p. 40–58] and the frequency dependence of human hearing and loudness perception [38, p. 89–106]. Here, following these research bases, we detail the methodology and preliminary findings of our survey, which has produced data under continuing analyses. Standard architectural and spatial acoustical measurement techniques employ near-perfectly repeatable sound sources that produce an optimal signal-to-noise ratio (S/N), typically using mathematically-generated audio test signals reproduced over precision loudspeakers. Our “human-centered” archaeoacoustics research employs reasonably repeatable human-produced sound sources, repeated several times for each test to account for variation. Ecological psychoacoustics research  demonstrates the utility of sound sources that are “ecologically valid”—in this case, both realistic and site-relevant. Using human-performed instruments to produce sound in situ offers advantages for reconstructing site acoustical dynamics realistically . A methodology using both culturally relevant, human-produced sound, and a standard audio test signal yields data with the broadest analytical potential. During the survey, researchers documented absolute and relative measures, as well as subjective observations about survey sounds and contingent site-specific factors (e.g., weather conditions, human activities, and ambient sounds). For test signals, we selected a sequence of sound producers that would permit comparisons of production mechanisms, acoustical frequency coverage, and source directivity. Figures 4, 5, 6, 7, and 8 illustrate the differences and similarities in sonic frequency content of these test signals, as power spectra of characteristic samples of each test signal, produced by analyzing audio recordings made during testing. 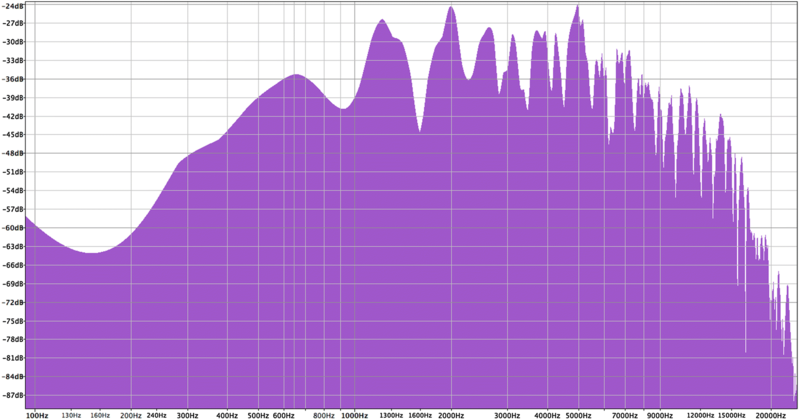 These spectral profiles (here, given as power spectra) of the survey test sounds show that each contains a different proportion of sonic frequencies, with some signals (pututu and whistle) having focused frequency ranges, thus producing identifiable tones. We follow acoustical practice by experts in musical instrument acoustics such as Fletcher and Rossing  who use power spectra measurements to characterize the specific frequency profiles of instruments.4 By testing all sound sources at each survey point, our method produced a comparative group of data points that covers the frequency range of human sound sensing, also providing examples from different classes of sound-producing instruments useful in extrapolating results to specific archaeological scenarios. To establish a baseline acoustical measurement reference within our experiment signal sequence, we piloted a portable, inexpensive audio system to reproduce a standard acoustical measurement signal. We are aware of the technical limitations of such a system, yet employed it in this study because (1) it provides a near-perfectly repeatable electronic signal that permits (2) reference calibration of our human-produced sound source signals and (3) sufficient power for the platform-top measurements, the semi-enclosed architectural space in our survey, as well as the potential for more distant transmission and reception. We selected a miniature loudspeaker (Micro II by JBL, Los Angeles, CA, U.S.A.) for its relative portability versus quality, which reproduces a frequency range from 150 Hz to 20 kHz. We connected it to a high-quality mobile phone with audio playback (iPhone 6, by Apple, Cupertino, CA, U.S.A.) for test signal audio file playback (that model iPhone is a device that produces low distortion5 through its full-spectrum analog audio output jack). 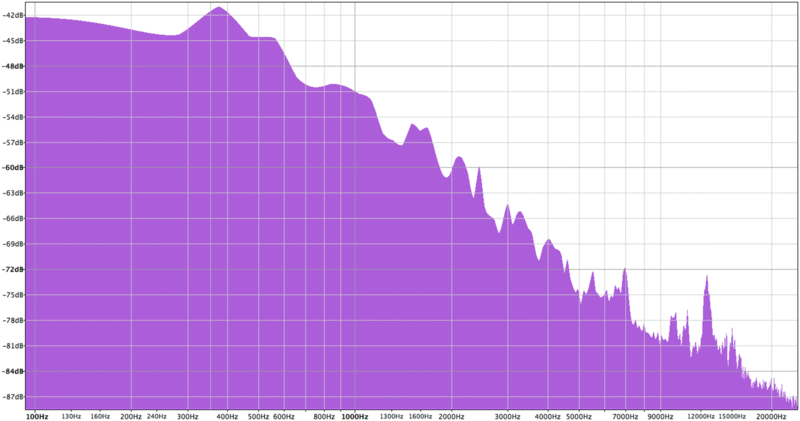 The repeated exponential sinusoidal sweep “ESS” test signal (Fig. 8), following Farina’s method , recently evaluated and recommended for its handling of noise and distortion by Guidorzi et al. 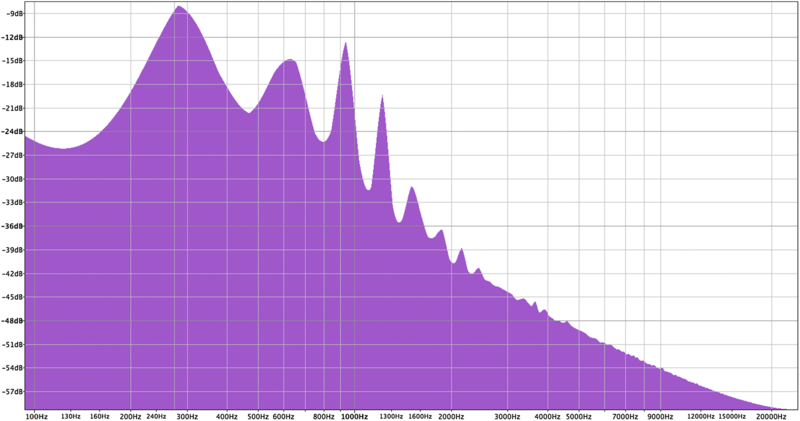 , covers the entire frequency range of human hearing (20 Hz–20 kHz), but is limited by the frequency response of the electronic playback devices (here, the range of the miniature loudspeaker). The manually produced signal most similar in range to the electronic sweep is that of the wooden clapper (Fig. 6), whose impulse-like sound covers nearly the entire frequency range. The sounding tone of the Lobatus galeatus (Strombus) pututu (Fig. 4) used in our survey is centered around 300 Hz, slightly lower than the fundamental frequency area of the broader-spectrum baritone male voice (Fig. 7). Acoustical research treats 1 kHz as a universal reference tone, which is perceived as being a relatively high sound, but is lower than the 3 kHz tone of the metal safety whistle (Fig. 5). The miniature loudspeaker/mobile playback system piloted in our survey is shown in Fig. 9a, with the pututu shown in Fig. 9b, c.
We designed the acoustical survey at Huánuco Pampa to be implemented by two researchers in one or two days of fieldwork. 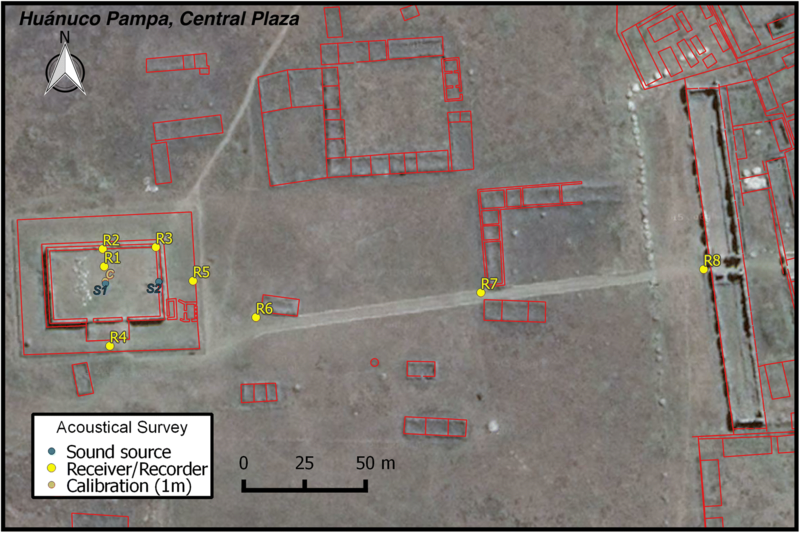 The study emphasized a comparative methodology, referenced to absolute measures, yet providing relative measures for cross-comparison, both in sound sources and locations around the surveyed area. We selected professional quality yet cost-effective, portable, battery-powered measurement and documentation tools, digital devices whose data could be recorded, GPS-tagged, and later analyzed. We specified sound source and receiver locations (survey points) based on acoustical considerations that were informed by map-based and on-site assessments of site structures. Following our requirement for an efficient experiment, we designed a rapid, extensible, and representative acoustical survey of the central platform and surrounding plaza based on a very limited number of source and receiver points (Fig. 10). We determined these points as representative of a variety of human sound-sensing scenarios with respect to site architecture, layout, and orientation with surrounding landforms. Specifically, we sought to generate data to contribute to a more comprehensive understanding of sound transmission and reception on and around the central plaza platform. An important design strategy for mapping sonic communication space was to provide comparative relationships among source and receiver points with respect to platform and plaza architecture. For example, we specified alternate source positions for the same receiver point, as in the projection of sound to point R6 from sources located at each of points S1 and S2, as marked in the Fig. 10 survey map. These two source locations typify contrasting platform-top usage scenarios with respect to sound production and audience address: S1 is located at the center-top of the platform, the best location for confining sound to that semi-bounded architectural space; S2 is located in the central niche of the platform-top wall on the east side of the platform top, allowing for both visual and sonic projection outward toward one side of the plaza. Although there are architectural and landform differences on all sides of the platform, the platform is roughly centered, and the eastern direction we chose provides a connection with site areas including the administrative palace . Because of the approximate symmetries of architecture surrounding the plaza, we expect that measured dynamics from the east side would be extensible to similar spatial contexts in the other three directions. Survey source and receiver points provide specific examples of architectural features whose relationships are repeated in other locations around the platform and plaza. These contextual factors provide both specificity and extensibility to our experiment design. The acoustical survey procedure was to audio record, measure (with sound level meter, referenced to the A-weighted decibel scale, dBA), observe, map and otherwise document a sequence of test signals (from the five sound sources detailed above) transmitted between multiple source and receiver points. Complementary and redundant forms of documentation and measures, combined with recorded audio, permit extensive post-survey acoustical analyses. We made reference measurements at 1 m distance as calibration data for each of the five sound sources. Acoustical documentation included sound level measurements and audio recordings of test sound signals, background sound, windy gusts, and environmental events that occurred during testing. All sonic tests and accompanying documentation were audio recorded using a 1.5 m-high tripod-mounted professional digital audio recorder (PCM-D50 by Sony, Japan) set to record uncompressed PCM audio (WAV files) at 24-bit, 48 kHz resolution. These specifications provide a high signal-to-noise ratio (S/N) in documentation and adequate detail for post-survey analyses using standard audio digital signal processing techniques custom-implemented in the scientific programming languages OCTAVE (free software available from: www.gnu.org/software/octave/) and MATLAB (commercial software sold by Mathworks, based in the U.S.A.). We performed some additional audio analyses using software Audacity (a free and open source program: www.AudacityTeam.org) and Sonic Visualizer (free software developed at the Centre for Digital Music at Queen Mary, University of London, England, U.K.: www.sonicvisualiser.org). We prefer to use affordable, open source and shareware tools where appropriate, which increases accessibility to analytical processes we develop. The Sony audio recorder (with stereo microphones set at their widest, a 120 degree-angle, covered with a faux-fur windscreen) was paired with a GPS device (Foretrex 401, by Garmin, Olathe, KS, U.S.A.) on the 1.5 m-high tripod. Sounds were performed by a 1.68 m-tall researcher (Cruzado), who held sound-producing instruments at performance-appropriate heights, with each instrument performance repeated several times and averaged for each source-receiver test. Each survey position was documented with GPS-linked photographs, using a geotag adapter (MX-G10M, Marrex, Shenzhen, China) on DSLR cameras (Canon, Tokyo, Japan). Video recordings at the most distant points documented the delay between visual gestures and the arrival of their produced sounds. To calibrate the sequence of sound signals and survey points with an absolute measure, we made frequent measurements of sound level using a digital sound level meter (BAFX, China), recording peak levels for (1) background sound; (2) environmental sonic events (e.g., thunder); (3) peak levels for windy gusts; and (4) peak levels during test signal recording. We used the IEC standard measuring method of frontal address, as shown in Long [37, p. 122] and repeated and recorded each test signal several times, averaging level readings for each sound source. For sound level metering, we used the dBA scale, the acoustical reference scale most closely aligned with human auditory perception, as explained in Howard and Angus [38, p. 95–100]. Our sound level meter was less sensitive than the amplitude range of perceptible (and distinguishable) sound levels, as noted on audio recordings documenting researchers’ observations throughout. In the context of intermittent and increasing wind gusts during our survey, the 30 dB threshold of the sound level meter did not permit the instrument to detect many of the quieter sounds we could hear, understand, and record; therefore, for a few survey events we have made relative estimations of levels calculated from audio recordings (as noted later in Table 1, shown in the “Findings and interpretation” section, where we discuss the relationship of background noise levels and signal audibility). The sonic frequency range of detection for the sound level meter was between 31.5 Hz and 8 kHz, which is adequate to assess levels of the lower-frequency sounds produced by all sources, and to capture the perceptually most important higher frequencies. Full-range frequency data captured on the audio recordings provides the complete spectrum of source frequencies as transformed at each receiver location, important to post-survey analyses. Testing commenced on top of the central platform at Huánuco Pampa on 4 July 2015, at 10 a.m. The weather was cloudier than a typical “dry season” day in the northern Peruvian highlands, and dark clouds to the southwest signaled an approaching storm. Winds increased around 11 a.m., occasionally contributing to 50–70 dBA measured peak noise levels during gusts; typical background noise readings without gusts were around 35 dBA. The storm moved into the area around 2 pm, with rain and hail starting around 3:30 p.m., marking the practical end of fieldwork. Although we have used temperature and humidity meters in previous Andean archaeoacoustics work—and strongly recommend logging these environmental data, along with wind speed and direction—we did not have access to meteorological tools. We noted the directionality of windy gusts, their noise level peaks (via sound level meter), and based on our team’s extensive experience in Andean fieldwork, made estimates of temperature (12–16 ℃), and humidity (47–68%). Temperature and humidity measures are useful in calculating the speed of sound during an acoustical survey, which can be used for alternate distance calibration with video-documented points, and data-driven acoustical modeling. The testing sequence followed the order of sound source (S) and receiver (R) numbering indicated on the survey map in Fig. 10. First, we made calibration measures 1 m north of S1, located at the center of the platform. To capture platform-top acoustics, we then covered points between the centrally located source point (S1) and receivers within the plaza top, including a point halfway to the northern wall (R1), a point at the northern wall (R2), and a point in the northeast corner (R3). We then moved the sound receiver off the platform top, to central points near the edge of the lower surrounding platform, on the southern side, facing the middle of the staircase (R4), and on the eastern side (R5). Our final receiver point from the central sound source was on the plaza floor, several meters beyond the low-platform receiver point (R6). To understand the difference in sonic reception between a source located out of receiver view, and a visible source projecting into the plaza, we moved the sound source into a niche on the eastern wall, overlooking the eastern side of the plaza (S2), from where we made a comparative measurement with the closest plaza-floor-located receiver point (R6). We then moved the receiver to approximately halfway between the platform and the eastern edge of the plaza, (R7). Our final receiver position was just in front of the doorway into the Zone IIA administrative palace (R8). For the mapping of survey points, we used GPS measures, digital and topographical maps, and photographs for location cross-referencing. For distance measurements between sound sources and receivers, we calculated shortest-path sound propagation distances—in acoustical terms, “the direct path” as shown by Blauert and Xiang [36, p. 163]—using altitude measurements at receiver locations from GPS averages: 3670masl for platform top; 3666masl for low surrounding platform; 3664masl for the plaza floor next to platform; 3657masl for the halfway point between the platform and eastern edge of the plaza; and 3657masl at the entrance to Sector II, the eastern perimeter of the plaza. These distances between source and receiver pairs are given in the left column of Table 1, in the following section. All data gathered during the survey informs interpretation. In post-survey analyses, measured sound pressure levels are related with concurrently recorded audio to track level and frequency changes in signals over their sound propagation paths and in comparison to other sound producers. These comparisons are central to our method, where the architectural and landform setting can be assumed constant (with documented environmental variation during testing), versus the distinct sonic features of each the five test signal sources. 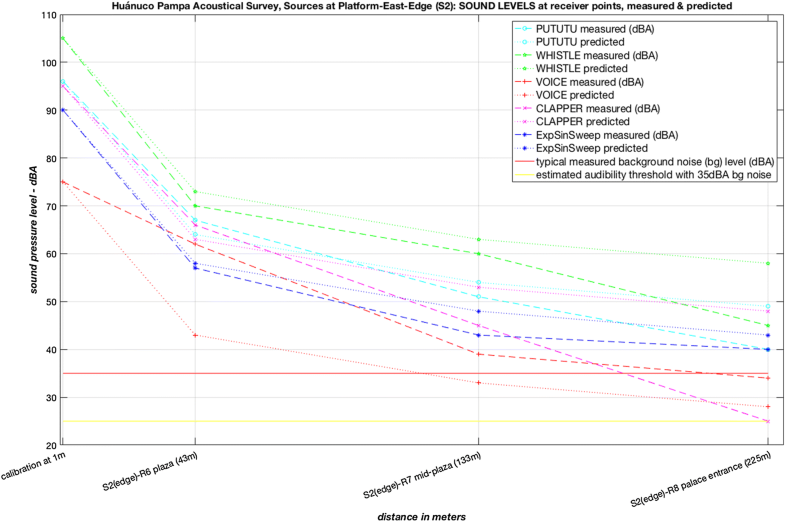 Here, we present the first stage of our analytical process: a functional interpretation of acoustical survey data in which we identify likely factors in differences between measured versus predicted sound levels (listed in Table 1). To do so, we examined the range of variation among sound sources for each receiver location, noting any trends in differences between measured and predicted sound levels, and using acoustical theory and experimental precedents to posit acoustical and temporal factors contributing to these differences. The visualization of levels across source signals and sample points (as shown in Figs. 11, 12, 13, and 14) enables rapid identification of trends and contrasts among receiver levels. 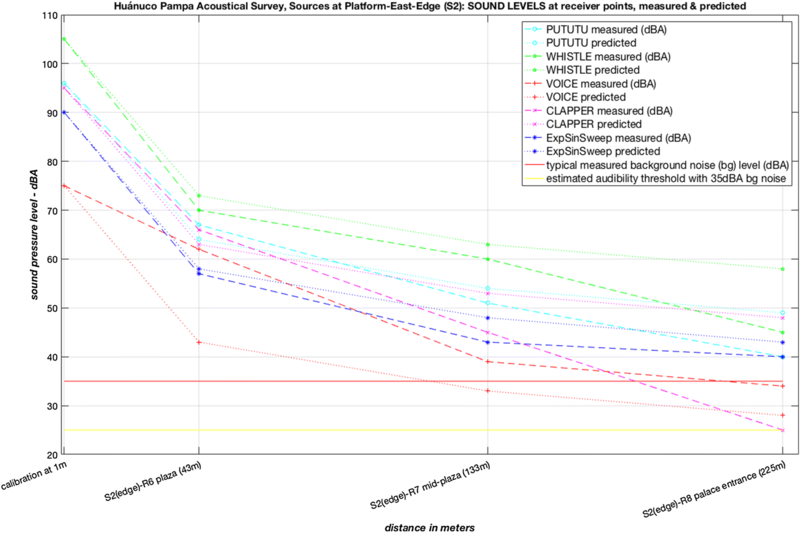 Charting the differences between measured levels and predictions for free-field sound propagation6 highlights contingencies of source and receiver locations (e.g., their surrounding architectural and landform acoustics), as well as possible effects of environmental conditions during the survey (documented as described in “Research design and implementation: a comparative method for acoustical field survey at Huánuco Pampa” section). We use the measure of free-field propagation specifically because it assumes no acoustical interactions, the sum of which we expect to see in the difference between measured and predicted values. Without interactions between source and receiver, sound level would be expected to reduce as the square of the receiver’s distance from the source, per the discussion of direct sound dynamics in Howard and Angus [38, p. 279–81]. Surfaces in the path of sound propagation provide reflective reinforcement of sound levels or damping reductions as a function of frequency (including phase interactions), material, and incidence angle; measured levels are assumed to be the composite result of these effects, including atmospheric/air absorption. In the survey location at Huánuco Pampa, air absorption of sound energy becomes an increasing factor around distances mid-plaza, and would increase with distance and dryness: in ranges pertinent to our study-day environmental conditions, air absorption is significant only for sound sources with energy in the high-mid to high frequencies. For sound sources having substantial energy at 1 kHz and higher, the estimated weather conditions during our survey would contribute around 0.5 dB reduction of sound level per 100 m, increasing to almost 1.5 dB/100 m reduction at 2 kHz, and around 3 dB/100 m reduction at 4 kHz, per references from acoustical experiments by Harris . Other references on the attenuation of sound by air, such as the canonical volume on acoustical measurements by Beranek, provide similar metrics [45, p. 66–7]. Therefore, at our plaza reception points R7 (133 m from source) and R8 (225 m from source), sound sources with frequencies predominantly in this range (e.g., whistle) should be substantially reduced in level compared to sound sources that are broader-spectrum, or those dominated by lower frequencies. Indeed, we find a notable difference in measured levels at the farthest point, with the whistle signal metering 13 dB lower than its free-field prediction for point R8. Air absorption would be expected to contribute to over half of this loss; the additional losses could be due to wind disturbance, which increased over the survey day to a maximum during the R8 measurements, with gusts measured at 65dBA of noise interference. For other sound sources in our testing sequence, air absorption would be less significant; for example, for human voice, there would be a reduction in articulation/clarity associated with higher-frequency components; for the Lobatus galeatus (Strombus) pututu (a strongly 300 Hz signal), there would be no discernible effect. Survey data are consistent with these theoretical expectations. Table 1 lists measured and predicted values for all source/receiver relationships. Local contextual evaluation of each receiver point and its relationship to site structures (including landforms) can help disentangle the likely contributing factors for measured deviations from predicted sound levels. By considering the variation in acoustical similarities and differences across the five sound producers against the constant of setting spatial acoustics per survey point, we can begin to relate architectural-spatial acoustics with receiver response characteristics at each point. This comparative method thus allows us to compare source responses (with attention to documented temporal variations during the survey) to isolate contextual acoustics. Because the sound sources are archaeologically appropriate and extensible to other Inca and Andean studies, and the architecture and landscape similar to other Andean sites, we expect that survey findings may be extended to predict dynamics of similar sound sources in analogous settings elsewhere. Temporal contingencies can contribute to testing variation, complicating the comparative analysis of different signals in the same space. To reduce these effects, we made several tests with each instrument at each location, and averaged the multiple level readings to account for variations in human performance, ambient noise, and weather conditions. Ongoing documentation, including verbal logging on the audio recording to note observed environmental events and condition changes, provides descriptive temporal data. Outlying values departing from measured trends might indicate a temporal contingency. For example, if a measured level departs considerably from its trend and/or the trends among sources, we check measurement documentation (notes, audio recording, photos/video) to ascertain whether there might have been an event (e.g., wind gust) that influenced testing conditions for the outlier, as compared to other signals. In our survey, one notable set of outlying values likely relates to sound production mechanism and source radiation rather than temporal contingency. For example, the “S2” differences chart (Fig. 14) shows significantly lower levels for the wooden clapper sound source than other signals at distance (R7 and R8 positions). The most likely explanations for this are (1) that the percussion sound production mechanism entails greater range of performance variability than the other sound sources; and/or (2) that the clappers were held above the performer’s head, higher than the other sources (and potentially with greater absorption from the performer’s body), therefore reducing any initial reflection from the top-wall surface that might bolster sound projection. Additional source measurements to generate radiation patterns of the sound-producing instruments/mechanisms could help substantiate this explanation. With respect to the architectural context of platform-to-plaza, this interpretation suggests that sound-producers having forward-downward directionality would be better suited for the purpose of projecting sound outwards across the plaza, for higher levels of reception at distances. Further substantiating this functional interpretation, we find in our data that the sound source with the greatest forward-downward directionality, the human voice, demonstrates an opposite trend to that of the clapper, at R7 measuring several decibels higher than its prediction, and at R8, measuring (from audio) what amounts to almost double the loudness predicted (10 dB is a doubling of the perceptual quantity known as “loudness”; see explanation by Howard and Angus, [38, p. 98]). This finding indicates that for the plaza setting at Huánuco Pampa, human voice should be assumed as relevant as other sound producers (and potentially superior in its ability to provide semantic content), especially when considering scenarios of plaza address from the central platform edge. Two structural features could provide reflective sound reinforcement, especially at R8: the plaza sector/kallanka wall a few meters away, and also the ground itself. Why these site features might help boost the vocal signal yet diminish the clapper signal is a question that can be addressed via examination of the frequency-dependent acoustical effects of these structures and their materials. Additionally, the higher-frequency spectral character of the clapper would be more susceptible to damping losses from the air, as well as windshear (see discussion about these factors in the “Conclusion”). Having precise sonic frequency data (from the recordings of these survey events) enables a detailed comparison between the clapper and vocal source, which we will pursue in future work to evaluate how the wall, ground, and air impact the reception of these two different sound sources. A trend that illustrates the efficacy of the comparative method can be observed in Figs. 11, 12, 13, and 14: the decreased range of measured levels across sources that increases with distance. As shown in Figs. 11 and 12, at the most distant point (R6), the 30 dB starting level difference among sources (measured at 1 m) is reduced to a 10 dB range of difference—equal to a perceptual reduction of sound level like halving the volume, twice (as explained in the previous paragraph). As shown in Figs. 13 and 14, in tests between the edge-platform source (S2) and the same plaza level position (R6), there is slightly less difference in range (half as much, 15 dB), still a substantial deviation from predictions. Free-field acoustical spreading theory predicts that the dynamic range of 30 dB across sources should be preserved at all reception points (for a theoretical overview, see Howard and Angus, [38, p. 21–6; p. 279–81]). However, these measurements are not made in free-field conditions; that is precisely the point of the method, to highlight the contributions of acoustical interactions. The discrepancies in proportional changes of level measurements across sources should correlate with frequency-dependent interactions between sounds and spatial constituents. In the above example, acoustical interactions from structures and materials, including air absorption, are not consistent across the different sound producers, which would be expected due to the frequency-dependence of acoustical dynamics and the contrasting frequency profiles of the different sound sources. This is precisely why using a sequence of contrasting test sound sources—and carefully measuring their acoustical features—is important to archaeoacoustical testing. Specifically, these disparities in level measurements across sound producers at each survey point relates to (1) the frequency-over-distance response variation among sources (note that we are averaging multiple tests for each instrument, to smooth out performance and other temporal variations), as well as (2) initial propagation differences due to interaction between source radiation patterns and the platform-top wall that demonstrably perturbs sound propagation. This trend suggests that there is substantial variation in the efficacy of distance transmission among our chosen group of source sound producers, details of which could be further examined from recorded data, with new experiments suggested to map the directivity patterns of these sound sources as a function of frequency to add detail to our modeling of initial propagation dynamics. The documentation of this trend strongly supports our comparative methodological premise. 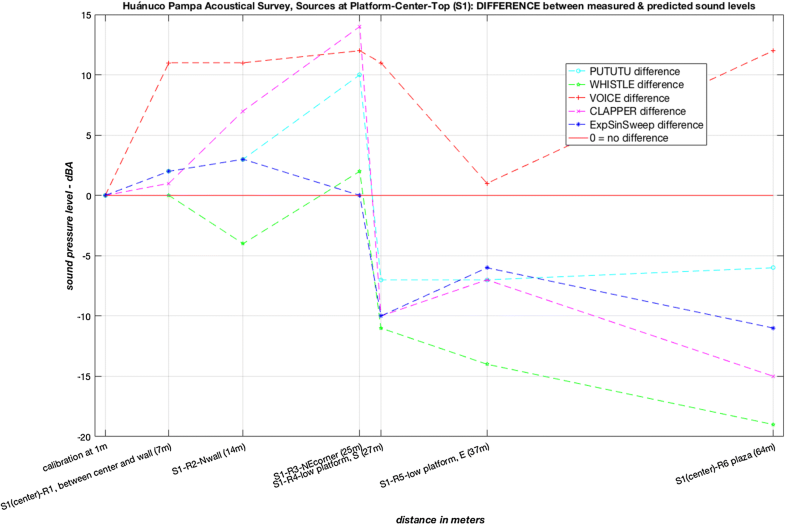 Our survey compared the plaza reception of sound sources from both a central location (S1) and a “wall-projection position” (S2) from the top of the platform, with results that indicate comparably higher sound levels in the plaza from wall-projected sources. The semi-bounded acoustical environment provided by the walled platform top has ramifications for its flexible use—as a visual-auditory locus for activities intentionally projected into the plaza and surrounding site, as well as a state-designed elite gathering area whose activities could be selectively restricted and obscured from perception in the plaza. Architectural acoustics contribute to making the platform-top an isolatable venue: as shown in measurements between the source at S1 and platform-top receiver positions, specifically S1-R2 and S1-R3, the height of the enclosing wall on the upper platform provides functional sound reinforcement by reflecting sound produced within the platform around its internal space. In our survey, sound reception within the platform-top walls, especially near a corner, was measured at levels that effectively double the perceived amplitude of sound compared to reception in free space. These measurements notably exceed even free-field predictions with corrections for adjacent surface reflections, as discussed by Howard and Angus [38, p. 41], where each surface contributes approximately 3 dB of reflective reinforcement. As the platform-top enclosing wall reflects interior sound back into that semi-enclosed area, it also prevents a proportion of sound (with frequency-dependence) from leaving the platform top, and therefore decreases sound transmission from activities within the top space of the platform to the areas below. However, if sound projection outside the platform top were a desired effect, then a person making sound could move to the wall and perform in a selected direction toward the plaza; the waist/chest-level height and inset niches of the wall (shown in Fig. 3) facilitate such interaction dynamics. Outward platform-edge address is one of the sonic communication scenarios also discussed in work on Inca platforms by Meddens and Frouin  and Stobart . Between the platform building and the plaza immediately around it, architectural “sound-shadowing” blocks and diverts sound transmission, depending on source and receiver locations, sound level, and frequency content. In the architectural acoustics literature, Long discusses the effect of barriers on sound propagation, and provides a diagram (Fig. 5.3) that illustrates a context similar to the dynamics between our platform-top sound source (S1) and the non-top reception points [37, p. 161–3]. Translated experientially, from the plaza ground and site surroundings, the closer to the platform one is on the plaza floor, the more difficult it becomes to discern activities on top of the platform, from both auditory and sound-sensing perspectives. Likewise, though via different acoustical dynamics, people atop the building will be somewhat isolated from sounds on the plaza floor in its vicinity, though with better potential for receiving sound that radiates upward and would be reinforced through some surface acoustics. And, there is a visual-auditory tradeoff: standing near the platform, one might be able to hear some aspects of the activities on top, but with no visual connection to those activities. Moving farther away, to a distance where some of the platform top is visible, one moves into the range of highly reduced sound levels (as well as asynchronicity of sonics and visuals),7 unless the sound is intentionally projected in a particular direction, from near the edge of the platform top, out over its perimeter wall. Those atop the platform would also have restricted visual access to people directly below or adjacent, unless they were looking out over the 1.5 m-high platform-top walls. For a visual reference: Fig. 3 shows the camera-framed viewshed when standing just beside a platform-top wall, looking along it; Fig. 15 shows such a viewshed when standing at the platform-top wall, and Fig. 16 shows such a viewshed taken from near the center of the platform. From these photographs, the scale of platform-top (32.5 × 48 m) and its relative spatial isolation is evident. Our survey directly addressed the problem of predicting audibility given a specific sound source and spatial relationship, and challenges some of the dynamical and perceptual assumptions that frame prior Andean archaeoacoustics fieldwork [17, 23]. By using a physics-based experimental method with instrumentation capable of producing detailed frequency analyses of sound sources, we eliminate reliance on theory and provide empirical evidence given best-case and reasonably representative environmental contexts for sound reception. It is always possible to create noise interference or attentional distractions to obscure audibility; however, in this work we seek to establish thresholds of possibility for the spatial and architectural setting around the central platform and plaza at Huánuco Pampa. The contextual soundscape does impact sound reception; however, prior Andean archaeoacoustics research has focused on determining contextual factors (both site architecture and social functions) that complicate sonic reception, rather than facilitate it, which would be the goal of state communicators in Inca settings, of special importance to an administrative center such as Huánuco Pampa. Whereas the absence of confusing “masking” sounds enables better reception of specifically targeted sonic messages, it is problematic to identify background noise levels (the “noise floor”) with the threshold of audibility, a tendency we note across archaeoacoustics research. For many reasons, sounds may be audible, and even intelligible, below the background “noise floor”. There are several acoustically contingent elements to consider. The spatial constituents between and around source and receiver—propagation media and surfaces that reflect and absorb sound; structures, objects, even living beings—can significantly influence sound transmission. The directivity of the sound source also constrains how its energy is distributed; its initial radiation pattern influences how the path of sound will be affected by nearby structures, again, with respect to frequency: higher frequencies are more directional (due to smaller wavelengths) than lower frequencies (for a useful discussion of frequency versus wavelength, see Long, [37, p. 51]). Third, and central to our premise of sonic communication, the so-called “masking effects” of noise  are frequency dependent. Depending on the frequency profile of a sound signal, it may be more or less notable depending on the frequency character of its background noise context. Survey audio recordings are analytically useful in providing precise frequency content of background noise, for environmental and even social contexts. Whether or not a particular sound would be audible and intelligible (a slightly different consideration) is a contextual matter. Inca administrators would have sought to control the contexts for both private discourse and their public communications, as well as their ability to hear from constituencies. If distant listeners (here, in the plaza at Huánuco Pampa) are expecting to be addressed with messages of interest, their attentiveness will be primed and thus a platform-based speaker or performer could select from a variety of sound producers with reasonable potential for reception. Visual signaling by a performer/speaker to silence crowd noise is one multimodal communication strategy that we pose as a likely function of a raised central platform over a public gathering area. In order to combat background noise interference, purposeful sonic messaging intended for specific reception may be strategically optimized using techniques such as repetition, short words, limited vocabulary, coded messages, and multimodal reinforcement with accompanying visual gestures. Beristain’s work on Mesoamerican platforms has discussed such considerations with respect to speech signals . For the low end of the intelligibility range, Beristain uses the Speech/Signal/Noise ratio (S/N) to estimate that speech messages with values from 7 to 11 dBA are typically perceptible: “when the S/N value is further reduced, still the message can be fully understood, although the lower the value, it requires from little to a lot of attention and discipline… and then the S/N could be as low as – 10 dB”. In our study, we observed, recorded, and documented many environmental and survey test signal sounds well below the background noise level that were clearly intelligible, suggesting the potential utility of enhanced-sensitivity metering tools in future fieldwork. In the moderately windy conditions of our survey, background noise levels metered around 35 dBA, with some variation, with momentary wind gusts contributing 50–70 dB of noise interference. This effect built steadily from about 11 a.m. through the afternoon, a daytime weather dynamic typical of the dry season in the Andean highlands (corroborated by other Andean researchers, 17, 18, 23). The acoustical effects of wind should be considered one of the diurnal climate patterns built into the Inca site plan, which in turn can yield insights regarding the possible seasonality and scheduling of some plaza activities. The data from our survey contrast with previous archaeoacoustical estimations of audibility in outdoor settings, especially the research on Inca sites by Meddens and Frouin . Rather than set an arbitrary threshold for audibility, or correlate it with subjective metrics for speech production, as do Helmer and Chicoine , our survey experimentally cross-compares at each receiver point the acoustical responses of five distinct classes of sound producers relevant to Inca settings; we compare sound level measurements with corresponding audio recordings that permit post-survey analyses, verification, and nuanced explanations of the contingent factors that influence in situ observations. One important consideration is the acoustical character of contextual background noise, which we have recorded for further spectral analyses of the sonic environment during the survey. Data from our study show that given the typical background noise level of 35 dBA we measured, signals as low as 25 dBA can be detected—and even understood—by human listeners; Beristain’s work on Mesoamerican sites corroborates this – 10 dB audibility threshold below the background noise floor . 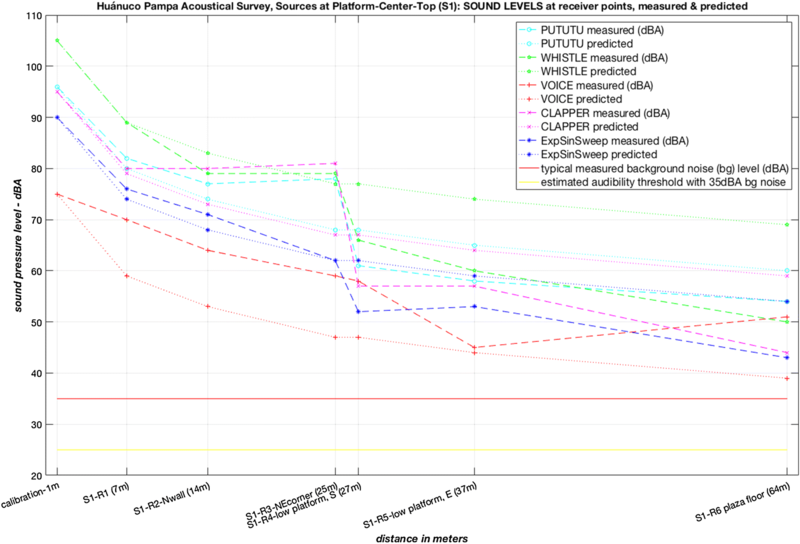 We compared in situ observations of both sound pressure level and audibility/intelligibility across our sequence of five sound sources at distant receiver points with recorded audio data. Figures 11 and 13 (above) show both the 35dBA background noise level (as a red line) and the 25 dBA audibility threshold (as a yellow line), well below the measured sound levels of most sound sources across points. Observations during our work on top of the central platform at Huánuco Pampa called to our attention the aural vantage of this raised, site-central structure. Although Colonial writers focused entirely on verbal messaging from such platforms, we note the efficacy of the platform as a point of auditory reception from sound sources out to the visual boundaries of the site. The platform offered those within its waist/chest-high enclosing walls an ideal place for hearing activities of people occupying a large area surrounding the plaza—including details of spoken conversations. This is a key consideration in evaluating the potential for monitoring and conveying sonic and visual messages between the platform other areas, including the possibility of coordinating the management of staple goods kept in the roughly 500 structures identified as storehouses (qollqa) laid out in rows on the hill to the south . The nearest qollqa are almost 1 km away from the platform center, and the most distant are around 1.7 km away. Depending on the source, intra-site sonic communication is possible across substantial distances and multi-directionally. Simultaneously field-surveying colleagues noted hearing our platform-located pututu sound source when they were near the southern edge of Sector VII. From the top of the platform, we observed and audio-recorded intelligible Spanish conversations from tourists walking westward along the plaza’s northern perimeter, a distance of 170–200 m away (Fig. 15). Throughout the survey, livestock vocalizations from beyond the site perimeter were clearly audible, demonstrating that sounds from the broader plain can be heard from the vantage of the elevated central platform. Other investigators who have studied the sonics of Inca platforms considered the outward distribution of sound from the platform [17, 18], but not the reception of sound on the platform, which we consider here to be a strategic function of its design. Although our study positioned sound sources on the platform, directed outwards from its center to an array of reception points, our method provided ample opportunities to observe and estimate the multi-directionality of sonic and visual dynamics. The communication between the researchers producing (Cruzado) and recording (Kolar) survey test signals is documented in audio and video recordings that allow post-survey analyses. As discussed, the consistent documentation of perceptual observations during surveying helps provide evidence for multimodal communication dynamics beyond measured data, and suggests areas for future research. The interpretation of survey data discussed here is only the beginning of a planned series of acoustical analyses using this dataset-in-development. Recorded audio data can be further compared and examined with respect to sound source characteristics (using a variety of frequency metrics, and also source directivity patterns) versus the dynamical contingencies of each receiver location (e.g., the surrounding architecture; proposed contextual usage; and human activities, considering configuration, density, and activities of occupants). Analyses in progress include evaluation of acoustical metrics for speech signals, estimating psychoacoustical implications from spectral data, and a comprehensive assessment of architectural/landform acoustical contributions, among other investigations. Subjectively observed sonic effects can be corroborated and quantified from the early reflection patterns notable in some of the audio recordings. An analysis of recordings to note the timing and levels of these structural and environmental artifacts could be mapped to a computational model of spatial acoustics and used to produce dynamical simulations and computational auralizations (sonic reconstructions for listening). The ample sonic frequency data in the audio-recorded measurements will permit us to apply speech intelligibility metrics, such as those suggested by Beristain , including the Articulation Index (AI) and the Preferred-Octave-Speech Interference Level (PSIL). To calculate these, we would also analyze the frequency spectra of background noise from all sample locations of the survey, referenced to absolute measures of background noise and wind gust levels. Future research applications include auralizations of different classes of sound-producing instruments in surveyed locations, and modeling of social interaction scenarios such as multiple simultaneous soundmaking groups in the plaza, and other archaeomusicologically relevant research activities. To make survey data available to other researchers, we envision the development of an archaeoacoustically responsive database system that will associate annotated multimedia data with contextual and analytical data. The acoustical survey detailed here advances Inca research by examining the dynamics of multi-directional sound production and reception around the platform in the central plaza at Huánuco Pampa. We conclude that the Incas designed this imposing structure to be a centralized communication hub. A functional space for multisensory messaging about elite presence, the central platform at Huánuco Pampa would have been a pivotal locus for communicating information and power. Yet, rather than solely facilitating elite-to-many address scenarios, as discussed throughout Inca literature, the central platform would have also functioned as a gathering place for elites to observe activities across the site and its surrounding areas, through both sound-sensing and sight. To advance site archaeology, our new method examines differences between measured signals and theoretical predictions, enabling us to identify and characterize dynamics of spatial acoustics that influence human interactions. 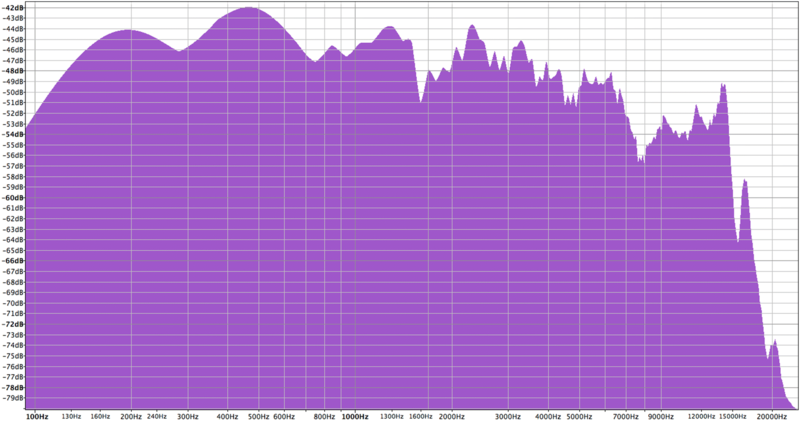 We have begun to correlate acoustical patterns with the distribution of other artifacts and construction features. These archaeoacoustical interpretations contribute new perspectives about the functionality of architectural and landform structures: how they influence the transmission and reception of sound, and thereby facilitate or hinder sonic communication. By examining spatial-sonic interactions with respect to the method of sound production and the specific frequency characteristics of each test signal source, we can identify which sound producers are more effective in which spatial and environmental contexts, allowing us to assess the likelihood that a specific sound-producing instrument or production method would be effective for a particular function. For example, our measured data on the sound-level enhancement created by the corners of the platform-top walls—especially for the whistle source that is acoustically similar to an Inca flute—demonstrates the efficacy of these low platform-top walls in reflecting sound back into the semi-enclosed space to provide substantial sound reinforcement and thus a private performance venue. Cross-comparing such interaction effects across the sequence of survey sound sources provides instrument-specific details that can be extended to acoustical dynamics in other similar stone architecture. Findings such as these can be extended to the computational modeling of acoustical dynamics of common forms of Inca architecture. Future acoustical surveys covering other site areas could produce inter-relatable datasets to provide stronger evidence towards acoustical-communication modeling of site areas no longer intact. In a novel and detailed contribution to both Inca studies and Andean archaeology, our data and analytical approach demonstrate the robustness of the Lobatus galeatus (Strombus) pututu as an outdoor distance communicator in windy Andean environments. Our data indicate that this Strombus shell instrument outperforms all other tested sound producers for distance transmission with minimal signal degradation, even for those having initially stronger signals. Acoustical performance in windy environments is of particular relevance in high-altitude settings. Extensive outdoor experiments by acoustics researcher Foss have shown that, for sounds with frequencies predominantly below 500 Hz (the energy of our Strombus pututu is centered around 300 Hz; Fig. 4), ”windshear has little effect on [sound] transmission” [47, p. 1091–92]. In locations where gusty winds are common—such as Huánuco Pampa, and many other Andean sites—an instrument practically immune to environmental conditions that disrupt the transmission of vocal sounds, flutes, and even percussion, would be extremely valuable. Whereas substantial archaeological evidence points to the importance of large conch shell horns in Inca society [17, 18, 48, 49], our research provides empirical data and a new acoustical explanation for this preference. We augment and provide nuanced data to support earlier work (while contrasting some assertions) confirming that the architectural design of some Inca platforms accentuated the capacity for sonic communication with surrounding spaces [17, 18, 49]. 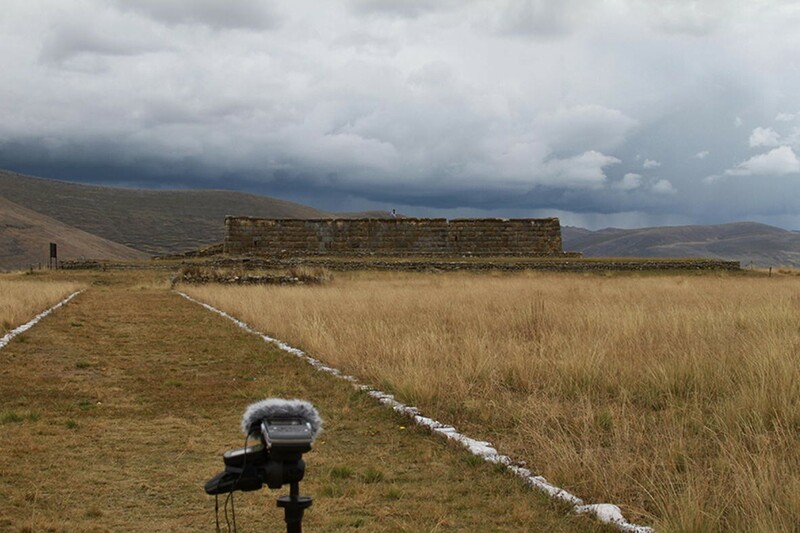 The visual and sonic observations of our study suggest that Spanish chroniclers were not mistaken in identifying platforms in Inca central plazas as places for the imperial elite to stage and disseminate state messages. Exploring the acoustical potential of the central platform at Huánuco Pampa demonstrates dynamical features of these informational display strategies. The sunken upper platform and its niched enclosing wall (Fig. 16) served to visually and sonically obscure many activities taking place atop the platform from people below. At the same time, selective use of platform-top architecture can facilitate sonic transmission to the most distant parts of the central plaza, and with some sources, farther. Our work supports assertions by Meddens and Frouin  and Stobart  that when Inca elites desired to be seen and heard clearly, platforms could be used for directed outward address: however, their work also poses caveats for instrument efficacy and transmission distance that contrast with our survey findings at Huánuco Pampa. The top-wall niches on the platform at Huánuco Pampa offered locations where any obscuring features of the platform could be bypassed to project very clear visual and sonic messages (Fig. 17). Our data demonstrate that sonic messaging can be optimized to the desired distance of transmission; for example, encoded signals (e.g., using Strombus pututu) could reach to the margins of the site (1.7 km) (corroborated in previous fieldwork, 32, p.36, and theory, 50), whereas specific vocalizations could be directed to many parts of the plaza, with reception depending on ambient noise, environmental conditions, and multimodal cueing for attention and silence. Our measurements from the platform edge suggest that verbal messages could not reach the entire plaza space simultaneously, due to their directionality. A plaza filled with noisy people would considerably affect sonic reception, and for that reason, visual displays from the platform top would be useful as signals to control crowd dynamics and enable a quieter background noise level to facilitate reception. Crowds could be addressed effectively from the platform edge if there were cues to compel the silence and attention of plaza participants. The methods employed make it possible for us to move beyond approaches to Inca platforms that focus solely on transmission from that central place. By testing acoustical dynamics both within the semi-enclosed platform-top, and between the platform and larger site areas, our study provides experimentally generated data that can be extended to estimate a multiplicity of communication scenarios on and around the platform. When desired, activities on top of the platform could be focused outwards, including the gathering of auditory messages from around the site and pampa. Data from the acoustical survey evince the difficulty of differentiating “site spaces” from “landscape”: the variability in range of “sonic boundaries” is contingent upon a combination of factors we have discussed, such as frequency content of the sound source, environmental conditions, and source-receiver relationship with respect to physical dynamics of setting, not to mention social context. Specific to questions regarding speech communication, the construction of the platform facilitated the transmission and reception of human vocalization over large areas of the central plaza, so that under certain conditions, that space could be used for very detailed communication, such as the tributary assignments that some Spanish chroniclers describe. At times of provincial festivities, elites could also collect visual and acoustical cues from the different parts of the plaza, allowing them to “take the temperature” of the crowd and maintain order. Early chroniclers—and perhaps for this reason, recent scholars working with these texts—have not recognized that platform construction could enhance multi-directional sonic communication. Archaeoacoustical data from the central platform at Huánuco Pampa offer some interesting directions for future research, although our results do not represent all Inca platforms. Repeating this methodology at other Inca platforms could generate perspectives on how widespread Inca acoustical planning was, as well as where different designs appear. Further experimental work could be carried out to address the acoustical properties of the interiors of Inca buildings, and our preliminary work at Huánuco Pampa could be extended by new measurements and observations when large crowds are present, such as during the annual July festival. Finally, the work reported here offers methods and interpretive framing that could be useful for archaeoacoustical work elsewhere. Our results suggest that acoustical design could be an important factor in the communication strategies of state elites, and sound valued as a means for ordinary people to provide information to their Inca rulers. In summary, our comparative method for archaeological acoustical survey enables efficient experimental testing of site-specific sonic communication dynamics, the identification and characterization of spatial-acoustical features, and the comparison of different means and qualities of sound producers. These findings facilitate data-grounded insights about the embodied experience of place, and thus understandings of human experience on various timescales. Via efficient multimodal documentation of research observations, we have produced a rich and extensive data set about communication on and around the central platform at Huánuco Pampa. 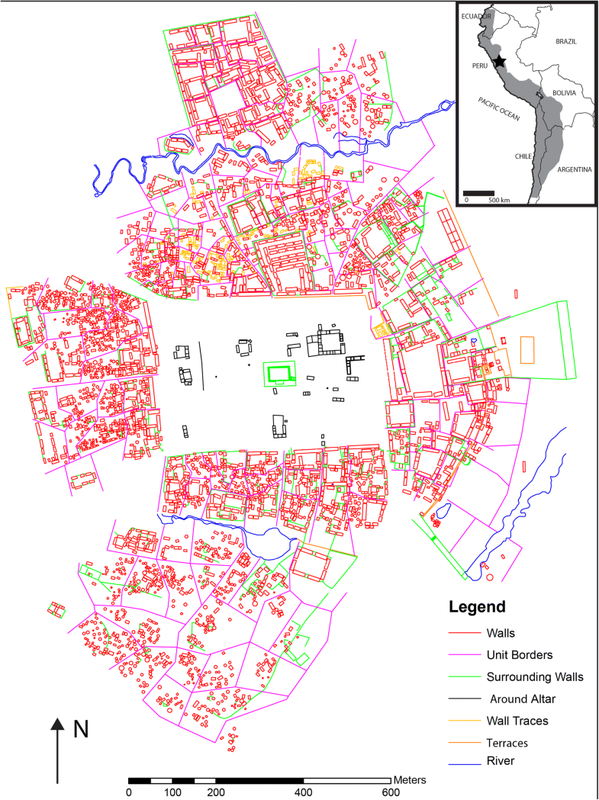 Disciplinary contributions include a dynamical understanding of the strategic design of Inca central platforms; a case-study example of the application of acoustical knowledge to a study of proxemics; a model methodology for archaeoacoustics, sensory archaeology, and human-centered environmental archaeology; and a new, comparative approach to the evaluation of spatial acoustics in cultural contexts. Kolar and colleagues [30, 32] have conducted acoustical measurements of Andean Strombus pututus (marine/conch shell horns most likely taken from the Pacific coast), especially to characterize the instruments excavated in an Andean Formative architectural context at Chavín de Huántar, Perú, where they have made extensive in situ performance tests with replica shell horns [31–33, 40]. In musical acoustics terms, horns have a conical bore, whereas trumpets have a cylindrical bore with a flare at the end, different internal structures with corresponding acoustical contrasts. Throughout Andean literature, and in previous works by Kolar et al., these animals have been referred to as “Strombus galeatus”; however, the current naming convention is Lobatus galeatus, per the World Register of Marine Species (http://www.marinespecies.org/aphia.php?p=taxdetails&id=565365). In acoustical science, the preferred test signal for system measurements, including architectural acoustics, approximates an ideal Dirac delta function [37, p. 590–2] or “impulse”, an instantaneous sound containing all frequencies at equal energy. In practice, impulses may be approximated by producing strong impulsive signals such as the iconic hand clap, as discussed in Long [37, p. 40] for quick observational testing of spatial acoustics, and more commonly, for architectural acoustics research, balloon pops. Spatial impulse response (IR) measurement is a standard acoustical technique in room acoustics research using balloon pops, “starter” pistol blanks, or a variety of loudspeaker-reproduced audio test signals to approximate an ideal impulse, such as the repeated exponential sinusoidal sweep (ESS) method pioneered and refined by Farina , and further tested and verified by Guidorzi et al. . In Fletcher and Rossing’s canonical work on the acoustics of musical instruments, they provide a power spectrum chart of the acoustics of a simple flute similar to some Inca instruments [42, p. 530; Fig. 16.18]. 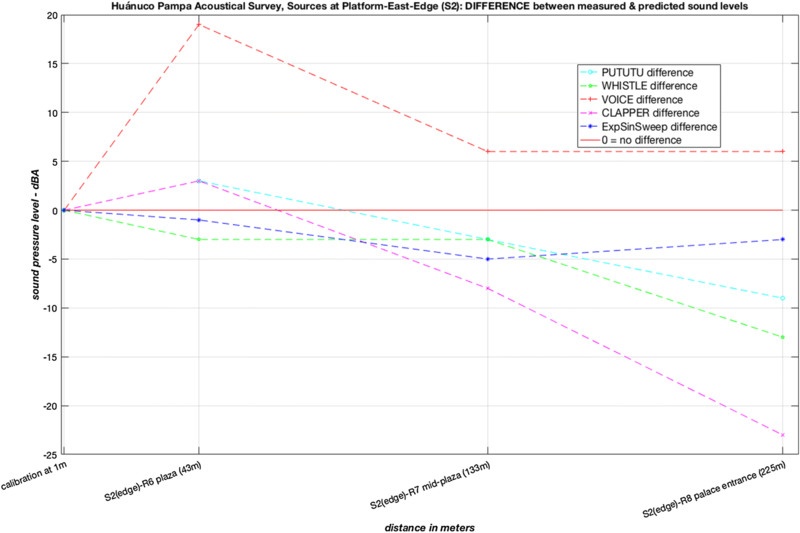 Whereas in their example, Fletcher and Rossing  measure the flute’s response to noise excitation, in our test we measured the humanly produced sound, which is relevant to our method for producing a baseline reference for the instrument recorded at 1 m. Previous archaeomusicological research on the acoustics of the Chavín pututus by Cook, Abel, Kolar and colleagues  demonstrated the consistency of spectral measurements between the technique used by Fletcher and Rossing of instrument-interior impulse measurements and the external audio recording of instrument sounding-tone spectra as we have done for the study at Huánuco Pampa. Audio measurements of the iPhone 6 and other mobile devices were made in 2014 by Ho et al., published online as “The iPhone 6 Review” (https://www.anandtech.com/show/8554/the-iphone-6-review/11). For predicted sound levels, we calculated free-field spreading losses, where sound level reduces as the square of the distance from the source; a discussion of acoustical spreading loss dynamics is provided in Howard and Angus [38, p. 21–26; p. 279–281]. 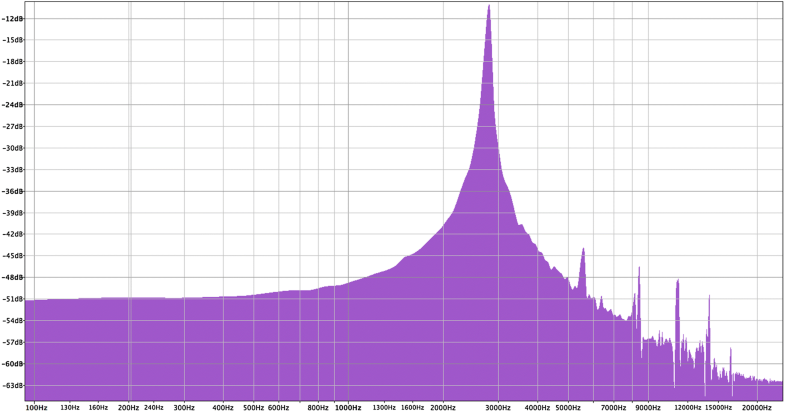 To make these calculations, the initial sound level of each source (measured at the 1 m calibration point) is taken as the reference quantity that is reduced according to the direct path (shortest distance) between source and receiver locations, for each survey point. Thus, the free-field sound level, predicted = [sound level at 1 m calibration] – 20 * log10 (distance between source & receiver) which provides a baseline estimation of unimpeded sound propagation over which any surface/materials interactions (such as architectural reflections and material absorption of sound energy, including air) would be expected to contribute level gains or losses, depending on frequencies present in the source signal. Approaching distances around 100 m between sound source and receiver, a notable discrepancy arises between the arrival times of visual and sonic information. For example, at receiver point R7 (133 m from source) (see survey map, Fig. 10), for the environmental conditions of the survey, there is a 0.39 s time delay in the arrival of sound from an action produced at the platform-top edge (S2), increasing to 0.66 s of delay at receiver point R8 (225 m from source). The implication is a perceptual disconnection between actions and sounds, which could confuse far-located observers. Sonic performances that simultaneously enact grand visual gestures—such as the clapping of our wooden percussion instrument above the researcher’s head—appear to present-day viewers much like a film/video with an out-of-sync soundtrack. In our video documentation of the wooden clapper sound source from R8 (225 m away), we see the clap, then hear it after the performer’s arms have returned to his sides, almost a second after the sounding action. Archaeoacoustical methodology, site application rationale and experiment, data analyses and presentation, communication theory and interpretation: MAK. Adaptation of site maps: JLCC. On-site experiment and multimodal documentation: MAK and JLCC. Site background and rationale, Inca administrative framing, communication theory and interpretation: RAC. All authors read and approved the final manuscript. At the time of the survey, Kolar held the position of Five College Mellon Postdoctoral Fellow in Digital Humanities. Charles Spencer at the American Museum of Natural History granted access to Craig Morris’ archives from archaeological research at Huánuco Pampa in the 1960s and 1970s, and he helped to secure support from the museum for new analysis and fieldwork, including what is supported in this article. Miriam Aráoz Silva was the Peruvian director of a broader architectural classification project at the site and secured the permit from the Ministerio de Cultura for the archaeoacoustical research. For providing additional sounds and spatial references for observation during the survey, we thank Charles Spencer and Elsa Redmond, Biviano Quispe, Pablo Romero, Jan Romero, and Victor Carranza. No field-specific standards exist for the preparation and recording of archaeoacoustics data; numerical data from survey is included in a table, in graphical figures, and discussed within the article. The Somerville Fund at the American Museum of Natural History provided support for the archaeoacoustical study reported here, and the University of Texas provided additional support. Kolar MA. Sensing sonically at Andean Formative Chavín de Huántar, Perú. Time and Mind. 2017;10(1). http://dx.doi.org/10.1080/1751696X.2016.1272257. Beristain S. Pyramids and basements. 2nd Pan-American/Iberian Meeting on Acoustics, Cancún, Mexico, 2010. http://acoustics.org/pressroom/httpdocs/160th/beristain.htm. Cook PR, Abel JS, Kolar MA, Huang P, Huopaniemi J, Rick JW, Chafe C, Chowning JM. Acoustic Analysis of the Chavín Pututus (Strombus galeatus Marine Shell Trumpets). In: Presentation at the 2nd Pan American/Iberian Meeting on Acoustics, Cancún, Mexico, 2010. https://ccrma.stanford.edu/groups/chavin/publications/ASA2010_ChavinPututus.pdf.